42. 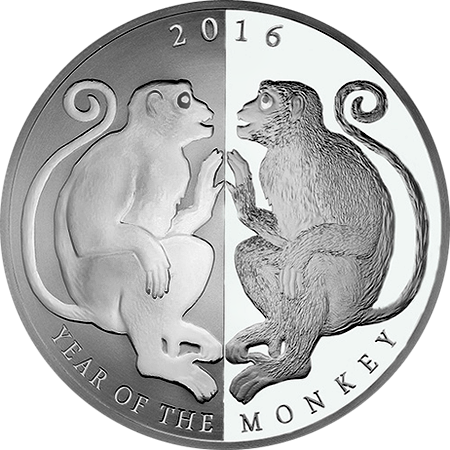 МОНЕТА "ГОД ОБЕЗЬЯНЫ 2016"
The intelligence and inquisitive nature of monkeys is highlighted on this large format 1oz silver coin. At an astounding 65mm in diameter, yet containing just 1oz pure silver, this coin is an excellent example of the Minter’s art. The coin is created in proof condition, with an intriguing mirror image finish – one side with the monkey in sculpted proof with a highly polished proof table, the other side with a frosted table and polished monkey. Minted by the Mint of Norway, with a tiny mintage, this Tokelau coin is definitely one to add to any lunar coin collection.